FRIGHTLAND has made numerous “Scariest Haunts in the United States” lists including Travel Channel, Forbes and Huffington Post. MIDDLETOWN, DE. August 21, 2017 – Frightland Haunted Attractions will open its World Famous gates for its 21st season on September 29, 2017. 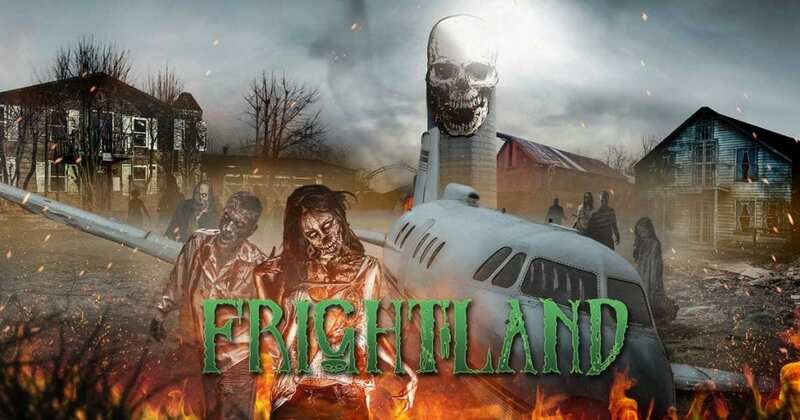 With 8 unique haunted attractions on over 350 acres of land, Frightland will once again be the fear destination for Fall. Ride through 30 minutes of pure terror on the HORROR HAYRIDE. Walk amongst the undead in RAVENWOOD CEMETERY. Come face to face with your worst phobias in FEAR. Take a stroll with the spirits of the ZOMBIE GHOST TOWN. Find your way through the pitch black maze of THE ATTIC; meet Dr. Idalia and his monstrous minions in IDALIA MANOR; Scurry through the two century old HAUNTED BARN; Do your penitence with your fellow inmates in ZOMBIE PRISON; Frightland’s 8 haunted attractions are uniquely designed to scare you to your very core! Frightland’s 21st Season opens with the discounted Sneak-A-Peek preview weekend September 29th & September 30th. Frightland’s resident DJ will be entertaining the crowd from the main stage. The amusements – multiple rides, games and carnival food – will be open beginning October 6th. Free souvenir photos are available at the photo booth. Frightland merchandise will be available for purchase at Little Shoppe of Horror. Popular discount theme nights returning include: First Responders Appreciation Night (October 8th), State of Delaware Employee Night (October 12th), College Night (October 15th), High School Night (October 19th), Military Appreciation Night (October 22nd), Greek Fraternity & Sorority Night (October 29th). Additionally, discount coupons will be available online and at participating locations of: Taco Bell, Subway, Philly Pretzel Factory, Metro PCS & Primo Hoagies. Frightland will kick off its 21st season by hosting the Delaware Mud Run 2017 & Delaware Mud Run: ELITE 2017 on Sunday September 17th as organized by Leukemia Research Foundation of Delaware. 100% of the proceeds will benefit Leukemia Research Foundation of Delaware as does 100% of Frightland parking fees. Frightland will be open from September 29th through November 11th, 2017.